Clint Eastwood directs Jolie as Christine Collins, a working, single mother in 1928 Los Angeles, who comes home one day to find her son, Walter (Gattlin Griffith) missing. As unbelievable as it sounds, the police (headed by Jeffrey Donovan and Colm Feore) deliver an impostor child to Christine six months later in a public political display, insisting it is Walter – against all the protests of Christine. They tell her that because she is the missing child’s mother, she is therefore “in no position to be objective”! It’s a little hard to accept that even the 10-year-old impostor (Devon Conti) could be in on the conspiracy. When this mother is pouring her heart out to him, beseeching him for the truth, how is he so well-versed in the Clint Eastwood Method of saying nothing? At such a young age, is he already indoctrinated with the spirit of the times that would regard women as inferior enough not to answer her? He also seems to take a leery pleasure in seeing Christine squirm. And how does he fool Walter’s friends, their neighbors, the school teachers? These questions are touched on minimally, but ultimately cannot be explained by the movie format, so leave us unbalanced – in this age of ultra-media that could disprove lies instantaneously. Two stories run congruently as Christine is traumatized and mistreated in the sanitarium, while Ybarra hears the stray boy’s testimony to being an accomplice to kidnapping and murdering numerous young boys with his uncle, a man named Gordon Northcott (Jason Butler Harner, who looks like a skinny Hugh Jackman). The two stories intersect when Walter Collins’s name comes up in the boy’s story. We never discover whether Walter was one of the murdered boys or one of a few who managed to escape. Writer Straczynski was inspired (is that the right word?) by the True Crime events of the Wineville Chicken Coop Murders. Yet there was another True Crime enacted in this case – that of the police department. If we find it hard to believe how a whole department can lie so brazenly, we only have to look to modern politicians – Hillary claiming she “landed under fire” in Bosnia, McCain claiming “the race is tied with Obama” – the only reason those 1920’s liars got away with their outlandish mendacity was that there was no DNA testing, no domestic photography… and no YouTube. Once again, Eastwood’s film making is impeccable. We never question we are in 1928, with the surroundings, social mores and misogyny of the time; when women were treated like lower-class citizens, or at least like the hysterical, emotionally-unbalanced gender that Freud and others postulated they were. Christine once told Walter, “Never start a fight. 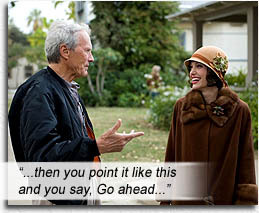 Always finish it.” Of course, that credo is the body and soul of Clint Eastwood. He said it flat out in WHITE HUNTER, BLACK HEART and each of his Avengers lives it to the bone. Christine (with help from her ally, Reverend Briegleb) would devote her life to exposing the police who handed her a changeling, finishing a fight they should never have started. Starring: Angelina Jolie, John Malkovich, Gattlin Griffith, Michelle Gunn, Michael Kelly, Frank Wood, Colm Feore, Devon Conti, Amy Ryan, Wendy Worthington, Jason Butler Harner, Eddie Alderson.